If he eats smaller meals, has fewer snacks between meals and also eats slower, it can result in weight loss that can affect his lean skeletal muscle. The loss of lean tissue leads to an increased risk of falls and frailty, among other things. To help meet the nutritional needs of the elderly, here are some of the things caregivers can do at home, suggested Dr Rao. Medical issues in older adults can affect their appetite. For instance, the side effects of certain medications, such as dry mouth, altered taste and indigestion, will lead to a decrease in appetite. Social circumstances may also mean many elderly people eat alone. As much as possible, have him eat in the company of others and let him eat what he enjoys, but in moderation. Find ways to stimulate his appetite. A short walk before meals can be helpful. Encourage regular mealtimes and give him sufficient time to finish the meal. In Singapore, patients who have suffered a stroke or have dementia, Parkinson's disease or some form of dysphagia (swallowing difficulty) are served minced, chopped or blended food. Dr Rao said such food is usually bland and served with rice porridge or pureed vegetables, which makes the prospect of eating unappealing. One alternative is to try soft foods such as tender cuts of meats cooked in gravies. 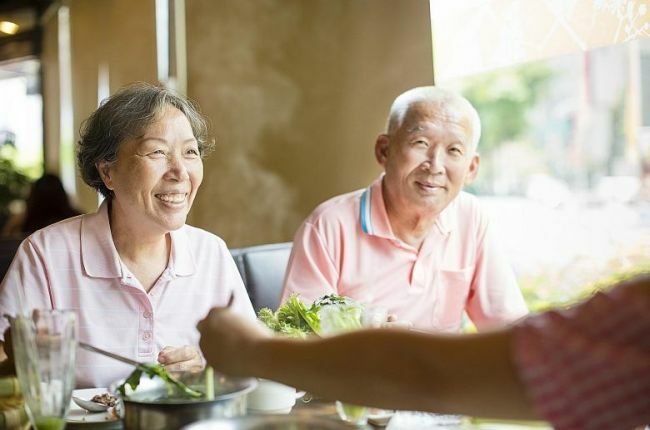 "While bearing in mind that some elderly have dietary restrictions like a low-salt diet, the addition of herbs and spices can make the food more palatable for them," he said. As large meals can be off-putting, use small plates and maximise the visual appeal of the food. And encourage seniors to have three small meals with regular in-between snacks of energy-rich, high-protein food such as seeds and nuts. Some elderly people may think they need less nutrient-dense foods as they grow older. Others may buy cheap food that are low in micronutrients. But it is even more important for the elderly to consume nutrient-dense foods, including fruit and vegetables, whole grains like oatmeal, lean meat, eggs, nuts and seeds, which are low in calories, but contain a lot of vitamins, minerals, proteins and healthy fats, said Dr Rao. Unless subject to fluid restriction, encourage seniors to drink between 1.5 and 2 litres of water a day, as this will prevent them from getting constipated. Choose nourishing fluids such as milky drinks, soups or fruit juices instead of tea, for example.